I found this interesting. 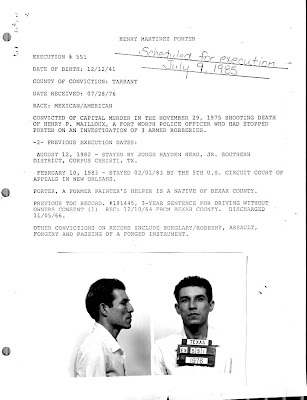 Somehow, while doing some research, I found myself on the Texas Department of Corrections information web page for executed prisoners. It was morbidly interesting, seeing what the prisoners did to deserve death. Some killings were so horrendous that there was no way you would want to share the same planet with this guy. Other killings were just plain stupid, over something as trivial as an argument over the price of a six pack of beer. What was more interesting to me was that at the very beginning, there were more White prisoners being executed than Black or Hispanic prisoners, but as time went on, that changed. I'm sure that White guys didn't stop committing capital crimes. Just that not as many were being executed for them. "I want to thank Father Walsh for his spiritual help. I want to thank Bob Ray (Sanders) and Steve Blow for their friendship. What I want people to know is that they call me a cold-blooded killer when I shot a man that shot me first. The only thing that convicted me was that I am a Mexican and that he was a police officer. People hollered for my life, and they are to have my life tonight. The people never hollered for the life of the policeman that killed a thirteen-year-old boy who was handcuffed in the back seat of a police car. The people never hollered for the life of a Houston police officer who beat up and drowned Jose Campo Torres and threw his body in the river. You call that equal justice. This is your equal justice. This is America’s equal justice. A Mexican’s life is worth nothing. When a policeman kills someone he gets a suspended sentence or probation. When a Mexican kills a police officer this is what you get. From there you call me a cold-blooded murderer. I didn’t tie anyone to a stretcher. I didn’t pump any poison into anybody’s veins from behind a locked door. You call this justice. I call this and your society a bunch of cold-blooded murderers. I don’t say this with any bitterness or anger. I just say this with truthfulness. I hope God forgives me for all my sins. I hope that God will be as merciful to society as he has been to me. I’m ready, Warden."